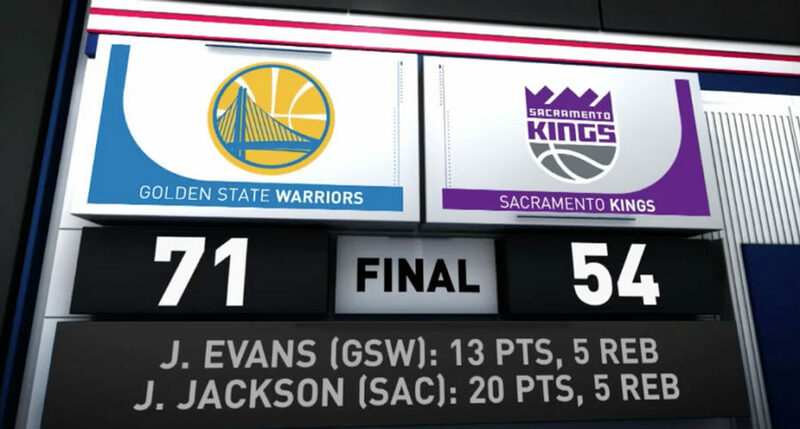 SACRAMENTO — Jacob Evans, making his debut, scored 13 points and Josh Magette added 12 and the Golden State Warriors eased to a comfortable 71-54 victory over the Sacramento Kings in NBA Summer League action on Tuesday. Magette, who played a team-high 28 minutes, made all three of his shots from 3-point range and went 4 for 6 overall from the field. Damian Jones grabbed a game-high eight rebounds for the Warriors, while Jordan Bell finished with eight points, on 4 for 5 shooting to go with seven assists, six rebounds, four blocks and two steals. Meanwhile, sophomore Justin Jackson had a game-high 20 points for the Kings in the defeat. He went 7 for 11 from the field and grabbed five rebounds. Frank Mason III added 16 points, five assists, four rebounds and three steals, while former Duke standout Marvin Bagley III pulled down seven rebounds, but was only 3 for 16 from the field for seven points in the defeat. Harry Giles played 28 minutes and had four points, four steals with three rebounds. He was 2 for 9 from the floor. Golden State improved to 2-0 in the Sacramento NBA Summer League, while the Kings dropped to 1-1. The Warriors NBA Summer League action on Thursday against the Los Angeles Lakers, while Sacramento will also be in action on Thursday against the Miami Heat.